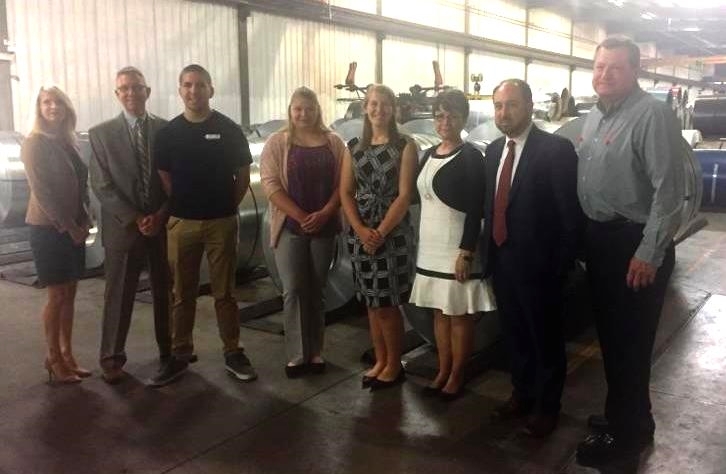 The Challenge Program, Inc. Schools that Teach/Jobs that Pay... - The Challenge Program, Inc.
On July 25, 2017, representatives from the Pennsylvania Departments of Education (PDE) and Labor and Industry (L&I) visited Corle Building Systems and met with participants of The Challenge Program, Inc., on a joint Schools That Teach/Jobs That Pay tour stop. The Challenge Program, Inc. develops relationships with businesses and educators, connecting students to their communities, and provides students with a hands-on learning experience that will foster career readiness and creates multiple pathways for success. PDE is currently looking to create a more holistic school evaluation tool that will focus on the individual students rather than standardized tests. The proposed Future Ready PA Index will serve as Pennsylvania’s one-stop location for comprehensive information about school success, and will highlight how schools are performing and making progress on multiple indicators. One such factor will be to incentivize schools to offer career pathways that culminate with high value, industry recognized credentials. “Partnerships developed between school districts and organizations like the Challenge Program are a valuable asset for students to explore career options, and will ultimately create multiple pathways for success,” said Dr. Volkman. Improving access to quality and innovative programs through enhanced funding is a hallmark of the Schools That Teach initiative, through which administrative officials have visited dozens of schools since 2015. To date, the Schools That Teach tour has made stops at dozens of schools across Pennsylvania. Corle Building Systems, Internships, Jobs that Pay initiative, PA Department of Education, PA Department of Labor and Industry, Schools that Teach initiative, Schools that Teach tour, The Challenge Program Inc.